I've recently placed an order for the Tentacle Maker toolbox, which is currently sat in Pinole, California with the USPS (pink marker on the map above for those interested in Geography...). The tentacle makers are reasonably simple pieces of kit which allow you to form tentacles or hoses/power lines etc from rolls of green stuff (or an alternative product (there are a few out there!!)). The results on the examples are excellent and I'm looking forward to trying these out in my conversion work. The price of the toolbox with all three gauges of tentacle maker, was only a little more than a single gauge kit and rolled in at a not-bank-busting ~£35 including priority international shipping. 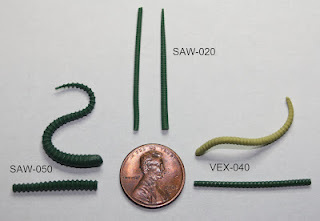 These are a couple of examples of the kind of thing you'll be able to make with these kits, along with a CAD demo of how each tentacle maker looks. The exposure of the TMs gained from the review on From The Warp has really propelled business at Green Stuff Industries, and the word on the site is that they're now having some demo pieces made up for a chain maker, which, if it comes to fruition, I'll also be ordering. Note: contains only boxes that are currently NOT in mass production, expect release beginning in June 2013 at the earliest. Guys, my blog activity has been somewhat limited over the past few weeks as any spare time I've had has been spent on prepping my Ork Kill Team for their forst outing and refreshing my memory of the 40k rules. As it panned out, the first game I played, was against Olly from the Bearded Arts and Dan of Hobby Before I Die fame. The Dakkajet has since been finished off with decals, the canopy, some heavy weathering, a re-painted pilot and a flocked base, but I managed to sneak it out of the mekboys workshop for a test flight. It was a free-for-all melee and you can read the full game report over at Hobby Before I Die right now! 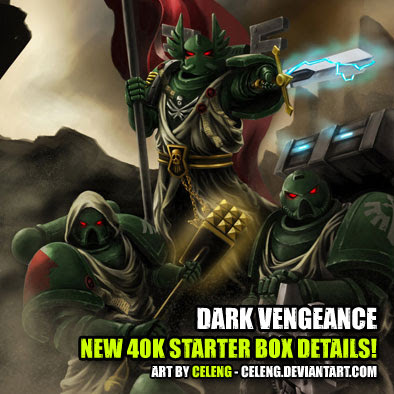 Just a quick post ladies and gents, but you can find details of the new Warhammer 40,000 boxed set 'Dark Vengeance' over at the Beasts of War site. The contents are sounding pretty good, and there is confirmation that the smaller rulebook is back in for this release, so all good I think. I'll certainly be ordering.